Blowout Sale! 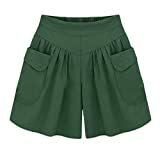 Up to 53% off on Shorts at Scrun For The Fallen. Top brands include alice + olivia, Allegra K, GARCIA JEANS, Natural Healing Co., Kaeli Smith, SOODEAR, CAIYING, Govc, AvaCostume, Yoyorule, Romwe, Rag & Bone/JEAN, DIDK, VIV Collection, WDS, Siwy, Lilly Pulitzer, Creazrise, & Simplee Apparel. Hurry! Limited time offers. Offers valid only while supplies last.